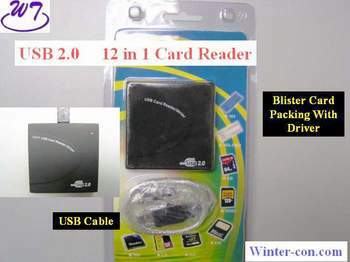 Compact Flash Card I/II, Microdrive, Secure Digital Card, Reduced Size Multimedia Card, Smart Media Card, Multi Media Card, Memory Stick, Memory Stick Pro, Memory Stick Pro Duo, Mini Secure Digital Card and xD Card. Compact size with external USB Cable. Supported Windows 98/98SE/ME/2000/XP, Linux core 2.4 and Mac OS 8.6 & above DRIVER FREE for Windows ME, 2000, XP, Mac 10.1.2 and above. Overall thickness is less than 1.5 cm. Plug & play and Hot Plug feature.